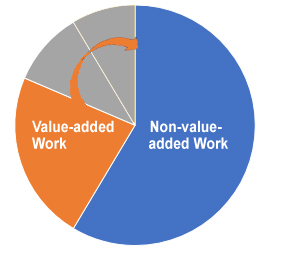 How Much of Your Work is Value-added? Most of us would likely agree that we want our workforce to spend most if not all of their time on “value added” work, which is often defined as the work our external customer would be willing to pay for, if they knew what we were doing. But studies indicate that even in the ‘best performing’ organizations, “value-added work” is well under 50% of the work being done! 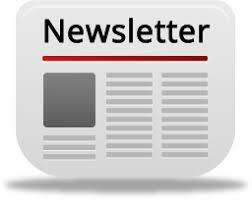 Work product that does not match customer needs or customer needs that go unmet because they have not been surfaced. If this list is a familiar one, you’re not alone… and while this list could go on, the point is that there is a huge opportunity for improvement for most of us if we could simply convert just some of the non-value-added work into pure value-added work. Identify root causes of errors, defects, etc. Sometimes this is a product, sometimes a service, and sometimes a combination of product and value adding service. For example, a value adding distributor delivers the product to a work-site, but can also prepare or pre-stage the material so it is ready to be put into use, saving the construction company time and money. The value goes beyond the product they sell to the service of presenting it in the form that is ready for use. But a large portion of every organization’s resources goes not to true value creation but to all the additional activities we have in place because we have not yet found a way to make them unnecessary. For example, if given the choice, the customer would be willing to pay us to do the job right, but not to pay us to do it wrong first and then fix it. Would they be willing to pay extra for error-prone processes that require us to inspect the output to try to find the mistakes? Would they be willing to pay us to warehouse inventory (as it slowly grows obsolete), or to build in features they would never use? Would they be willing to pay us to wait for the work that is held up by our bottlenecks? The customer may be willing to pay the price we ask, but all of the waste is on our dime. Every bit of it we can eliminate can be taken right to our bottom line. Many people and functions play a vital role in helping the internal customer provide value for the external customer by providing key enablers such as technology, safety, or information to those creating the value for external customers. Some of these people may also remove the complexities or problems from work, possibly through inspection and rework, or through process improvements. If we can eliminate the root causes of these complexities and impediments, the time we spend removing them can be redeployed to creating more value. However, if an organization is not yet well aligned and 100% focused on creating value for the external customers, internal customers may actually create waste by requesting products or services from internal suppliers (i.e., coworkers) that do not create value. This may include attendance at non-value adding meetings, reports that do not increase ability to serve external customers, data or analysis that do not increase ability to provide more value to the customers. We can manage this risk and increase alignment by constantly challenging and rethinking work to ensure it creates value for external customers or helps internal customers create value for external customers. 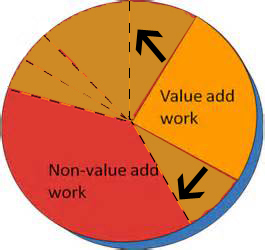 In our next post we’ll take this final point further, and identify specific steps for increasing the percentage of work that is value-added.